Focus of the book is actually on mastering shapes to use them effectively in watercolour paintings. So it's rather conceptual in a way that it forces you to think about your painting before you start. And it's great because that will make for a better painting. Every concept explained is accompanied by a demonstration that shows you, usually in three steps, the start, middle and final stage of the painting. I found the demonstrations to be particularly insightful. In the first stage, you can pretty much tell the direction of where the painting is going towards. The second stage usually blocks in the main subjects and the final stage with touch up on the details. The first two stages show how crucial those initial strokes can be. There are also lots of other watercolour tips, such as colour mixing, values, composition, tools, conveying textures and mode. The chapter on colour mixing would be quite useful because it talks about how sometimes you don't get the colour you desire even though you have mixed the correct primaries. Author and artist Leslie Frontz has a way to explain concepts very simply. 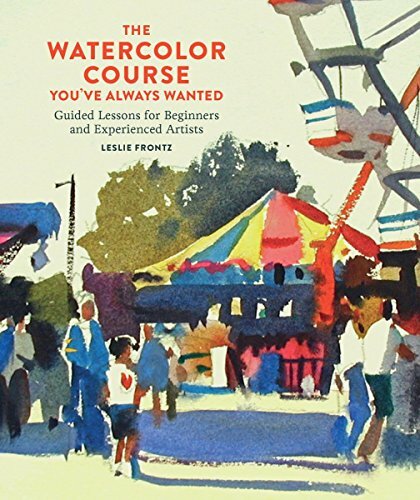 This is an insightful book for beginners and intermediate artists.